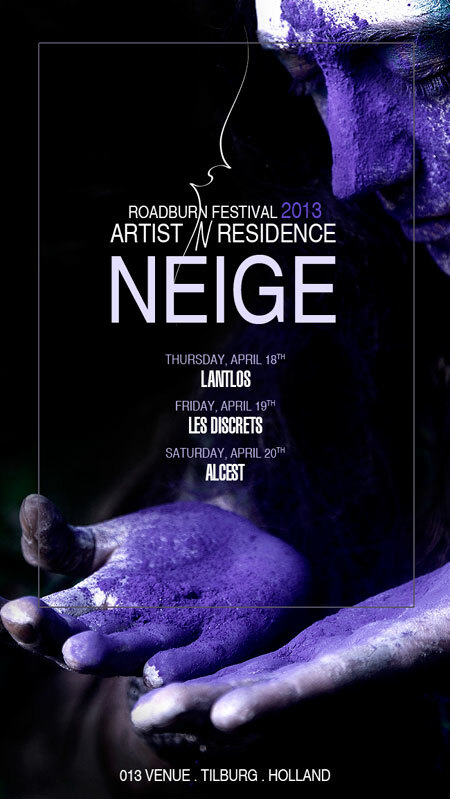 France’s Neige will be Artist in Residence at Roadburn Festival 2013, set for April 18 – 21 at the 013 venue in Tilburg, Holland. French black metal has always been conceptually diverse, a leading force in pushing the boundaries of the genre. Whether it’s the experimental, nihilistic, buzzing approach of Deathspell Omega and Blut Aus Nord, or Alcest‘s soaring, emotional meld of Slinty post rock, spidery, shimmery shoegaze, ambient sounscapes, and black metal fuzz, the French are definitely in the vanguard. Not surprising then, given Roadburn‘s penchant for honoring the innovators, that Alcest mastermind Neige is our Artist in Residence for Roadburn 2013. His credentials include blowing minds of the black metal world at large — a genre notoriously averse to innovation — with strong compositions and strong melodies, infusing black metal with an undeniable poppiness and ethereal dreaminess. These traits have been in evidence since Alcest’s 2-song EP, Le Secret, came out of nowhere to set the underground abuzz. He has continued refining his blackgaze sound, and has turned into an undisputable cult artist through the subsequent releases of Souvenirs d’un Autre Monde, Ecailles De Lune and Les Voyages de L’âme. He has been instrumental in inspiring hundreds of bands to take up his style of blissed out, melancholic black metal. Neige will carry on a tradition that began at the Roadburn Festival in 2010 with Enslaved, followed by Circle in 2011 and Justin K Broadrick in 2012 by playing 3 different sets during Roadburn 2013. It kicks off with him joining Germany’s Lantlôs on Thursday, April 18th, then on Friday, April 19th, he will perform with Les Discrets who are ronted by Fursy Teyssier, and sharing members with Alcest (including Neige) and finally Neige’s residency will lead into his main project, Alcest, performing the utterly majestic Les Voyages de L’âme in its entirety on Saturday, April 20th. For full information and flyers on Neige‘s residency at next years festival, head over to the Roadburn website HERE.